© 2002, © 2019 by Paul Freeman. Revised 1/20/19. 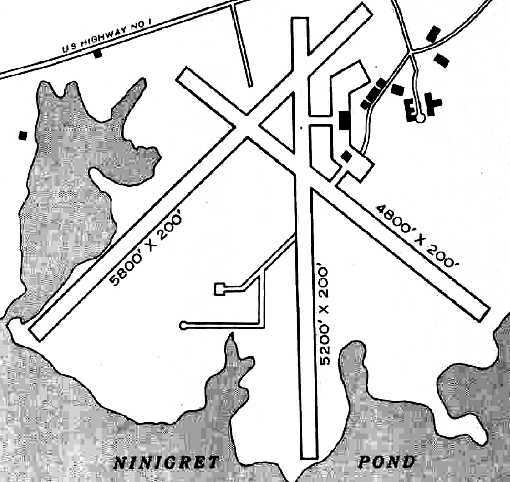 Coventry Air Park, as depicted on the 1955 Boston Sectional Chart. as it was not yet depicted on the July 1946 Boston Sectional Chart. which depicted Coventry as having a 1,800' unpaved runway. 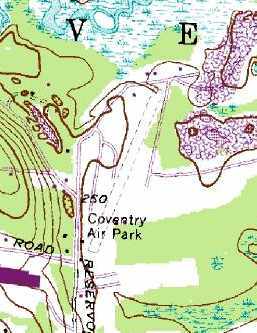 The 1955 USGS topo map depicted Coventry Air Park as an L-shaped clearing with 1 small building along the west side. Bob Farrell recalled, “In 1955-57 I had a J-5 Cub at Coventry Air Park. Another VS-31 pilot, Carl Morton, and I flew charters out of there to Nantucket & Marthas’ Vineyard. which depicted Coventry as having 2 or 3 grass runways. A 1963 aerial photo depicted several light single-engine aircraft parked along the southern edge of Coventry Air Park. According to an article in the Coventry Patch, “With expansive, flat terrain & manicured turf the area provided an ideal location for single-engine prop planes to land & take off. 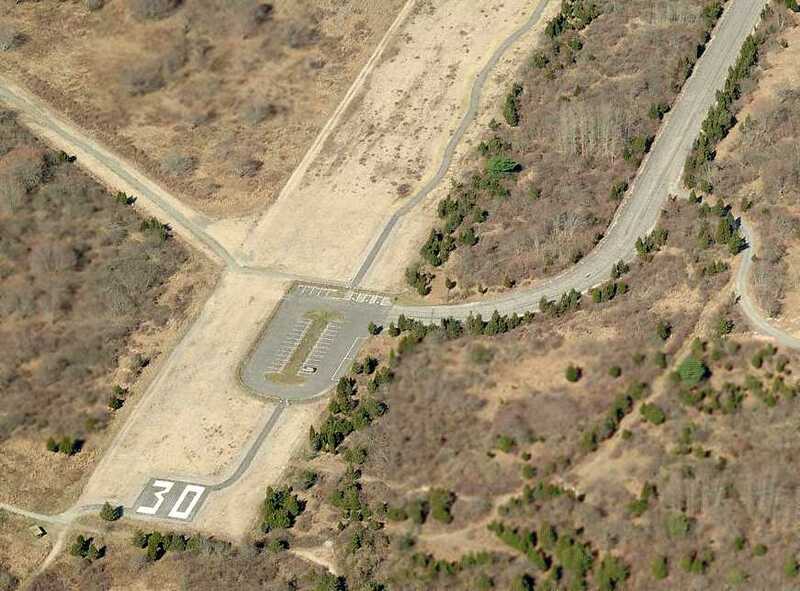 The privately-owned airpark was used by local aeronautical enthusiasts & others from as far away as NY & CT. Some pilots also offered lessons & used the airpark to provide hands-on training in the art & science of flying a plane. During the airpark’s heyday mobile homes ringed the perimeter of the field. Coventry resident Reginald Oliver who owned a television repair business recalled visiting several clients who proudly kept their Cessna or Piper Cubs parked in their driveway. 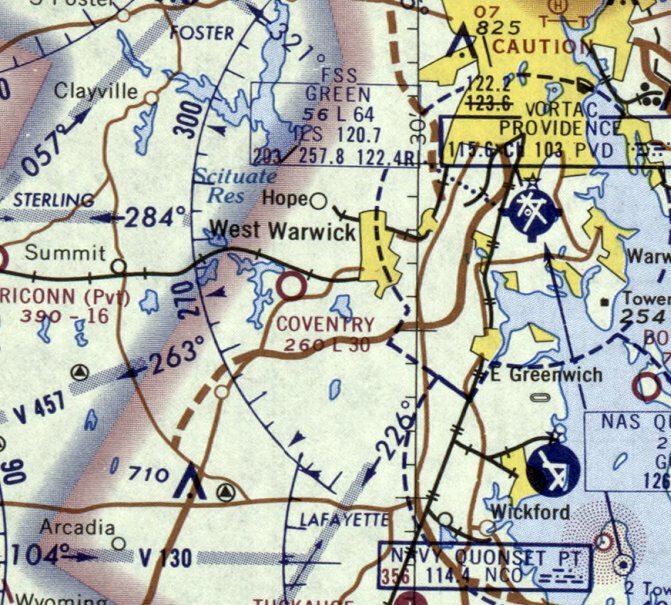 The 1965 Boston Sectional Chart depicted Coventry as having a 3,000' unpaved runway – significantly longer than as depicted a decade before. 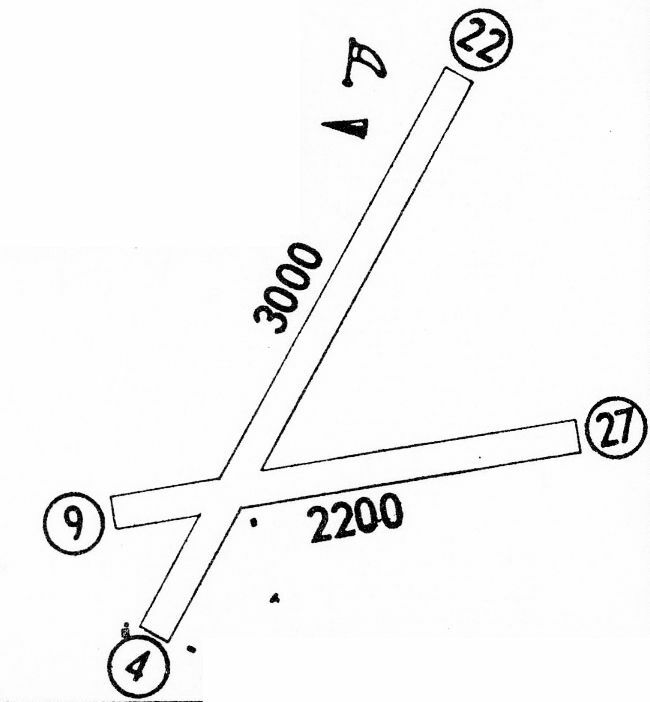 The 1968 Flight Guide (courtesy of Robert Levittan) depicted Coventry Air Park as having 2 unpaved runways, with 3 small building to the south of the runway intersection. 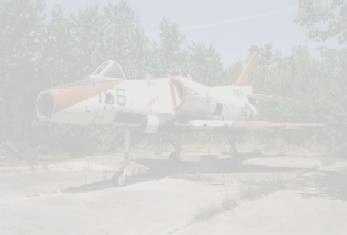 which depicted 3 single-engine aircraft parked on the southwest side. Trailers & houses had been built all along its west side, which would eventually spell the end for this little airport. 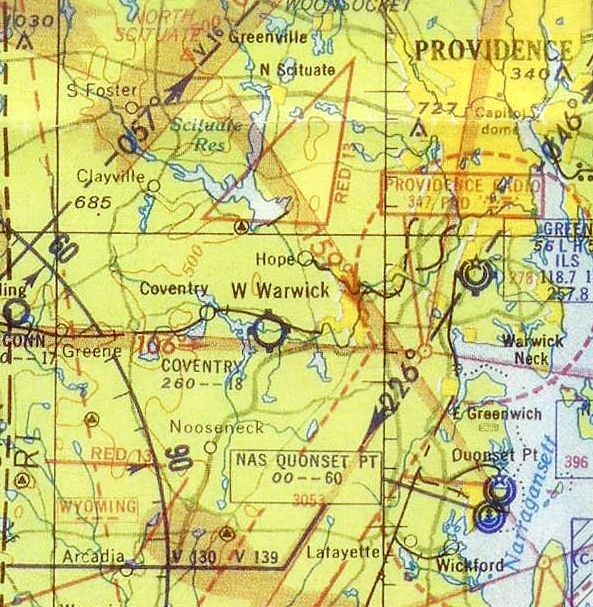 The last aeronautical chart depiction which has been located of Coventry Air Park was on the March 1970 Boston Sectional Chart. It depicted Coventry as having a 3,000' unpaved runway. which depicted Coventry Air Park as having a single unpaved northeast/southwest runway & 1 small building along the west side. A 1995 aerial photo depicted houses covering the site of Coventry Air Park. 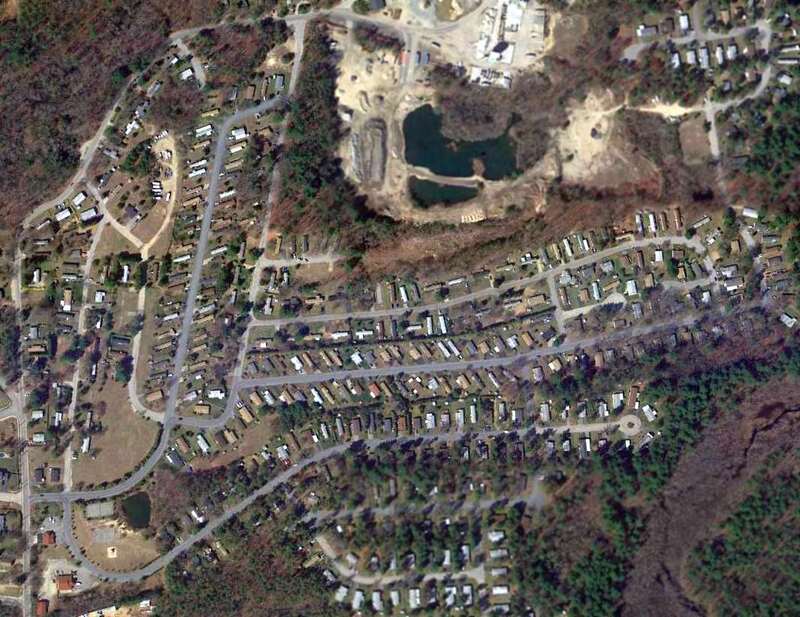 A 2012 aerial view show the overall property outline of Coventry Air Park remained recognizable, even with houses covering the site. with street names like Valiant Drive, Wright Way, Kitty Hawk Lane, and Lear Drive. Thanks to Bob Farrell for pointing out this airfield. 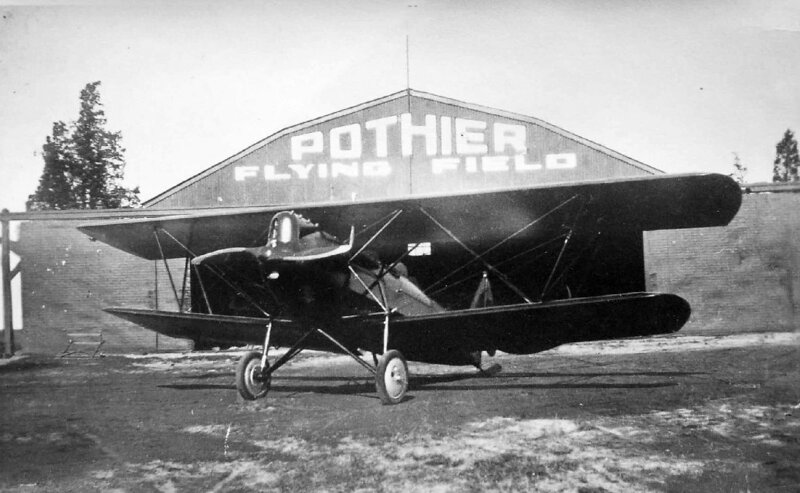 A circa 1920s photo of George Armitage's biplane (model unidentified) in front of a hangar marked “Pothier Flying Field” (courtesy of George's great-granddaughter Kim Armitage Hetland). at the summer community of Buttonwoods, about 8 miles south of the city of Providence. It is a small community of beach cottages, small year-round homes mixed in with a few larger well-maintained residences. in front of a hangar marked “Pothier Flying Field” (courtesy of George's great-granddaughter Kim Armitage Hetland). 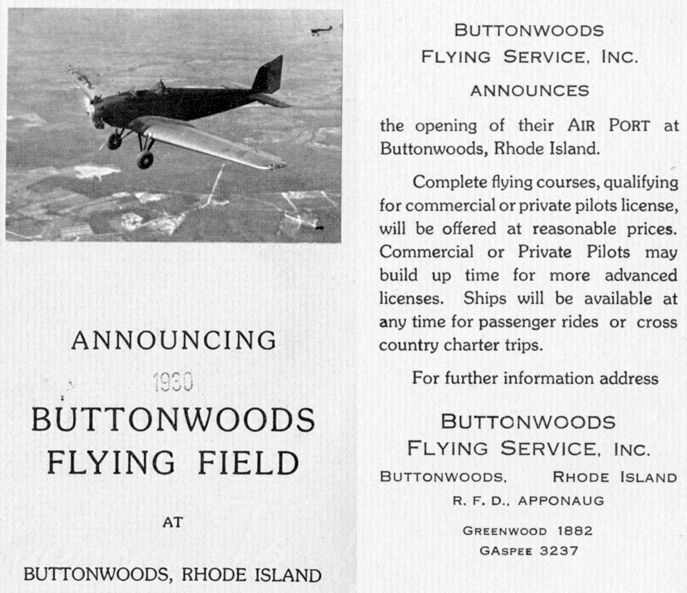 Pothier Field was evidently reopened in 1930 under a new name, “Buttonwoods Flying Field”, as announced in a 1930 brochure (courtesy of Tom Heitzman). 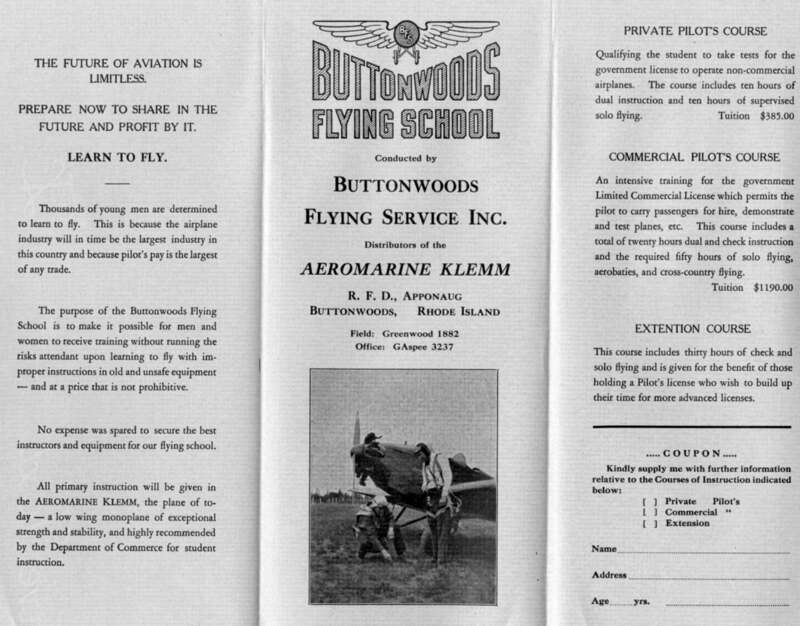 It described the services offered by Buttonwoods Flying Service Inc.
A circa 1930s brochure for the Buttonwoods Flying School (courtesy of Tom Heitzman). 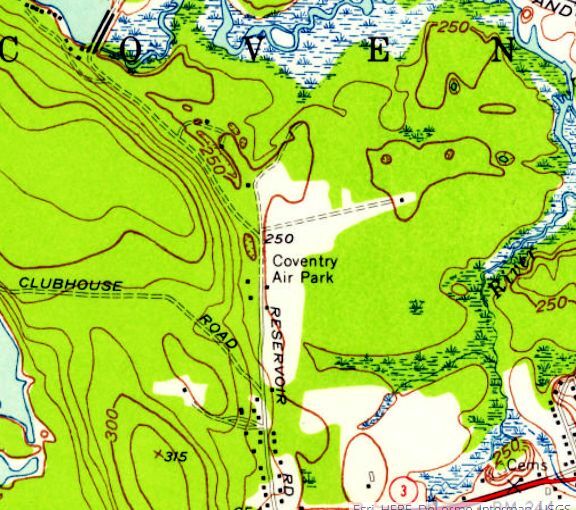 A circa 1930s map (courtesy of Tom Heitzman) depicted Buttonwoods Flying Field as an L-shaped property. and no further references have been found to the airport. A 2015 aerial view shows no trace remaining of Buttonwoods Flying Field. 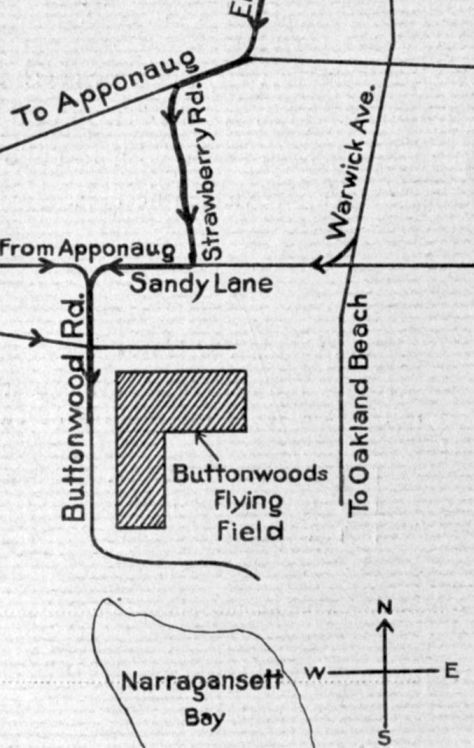 The site of Buttonwoods Flying Field is located southeast of the intersection of Buttonwoods Avenue & West Shore Road. Thanks to Tom Heitzman for pointing out this airfield. 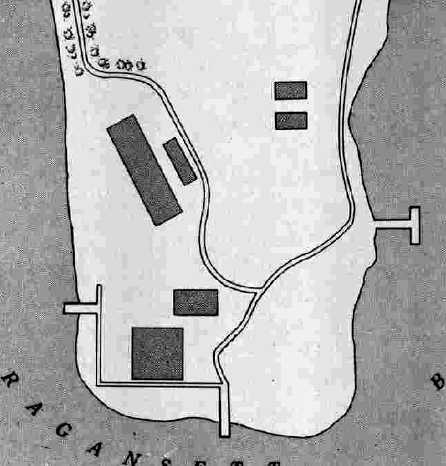 The Gould Island seaplane facility, as depicted on the March 1933 Boston Sectional Chart. a 56-acre tract located off Conanicut Island in the East Passage of Narragansett Bay. 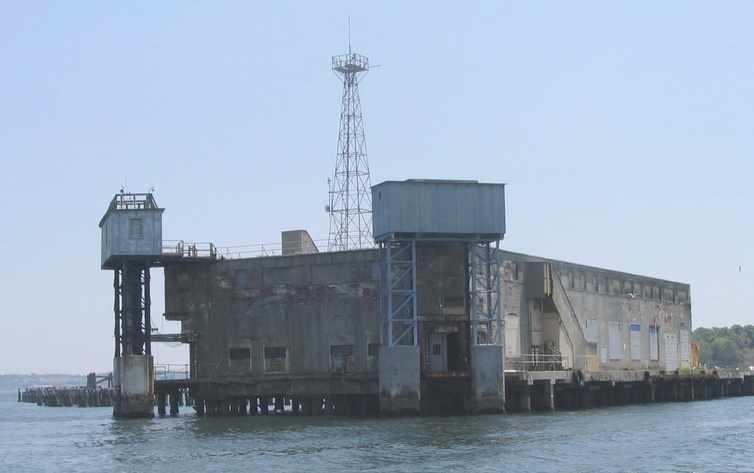 and the next year the Newport Naval Torpedo Station added a new storage facility on Gould Island. and a concrete pier for torpedoes at the southeast point of the island. The former Haughton family residence was converted to a barracks for the Marines who guarded the magazines. to provide torpedo & warhead storage as well as housing for a Marine detachment. In 1920, a Naval Air Detail was established under Navy Lieutenant Thomas H. Murphy. arrived at Gould Island, and were based at a newly built hangar of steel-frame & wood construction near the south end of the island. A concrete platform & ramp were constructed, oriented toward the west. The aircraft were to be employed to test-drop aerial torpedoes. or, later, from the Firing Pier at the north end of Gould Island. made the first successful U.S. air drop of a torpedo in the waters off Gould Island. In 1931, hangars & ramps were constructed at the southern end of Gould Island. was on the March 1933 Boston Sectional Chart. It depicted the seaplane base (with an anchor symbol), but did not otherwise identify it. On 9/21/38, a hurricane brought an estimated $17,900 of damage to the Navy installation on Gould Island. As the winds built, 2 seaplanes were made fast outside, and all other planes were placed in the hangar. The hangar doors were closed. The tide rose around the hangar, and the area was swept by violent seas that broke in the east door of the hangar. The hangar’s south windows were covered with water. Shortly after 6:00 pm the seaplanes secured outside broke loose & drifted northward. One plane was badly damaged & sank about one mile north of Gould Island. were recovered near Beavertail Lighthouse about 7 miles south of the point that the plane was last observed afloat. The main doors of the hangar were carried away. Nine planes were damaged to the extent that they required major overhauls. that will become the Mark 13 torpedo used by aircraft in World War II. and then sent to Gould Island for drop tests of the Mark 13 torpedo. was a 1939 aerial view (from the RIGIS at the University of Rhode Island, via Chris Kennedy). with a single ramp leading into the water to the west. The northern end of the island was still undeveloped. Chris Kennedy observed, “You can almost read U. S. Navy on the hangar at the south end. 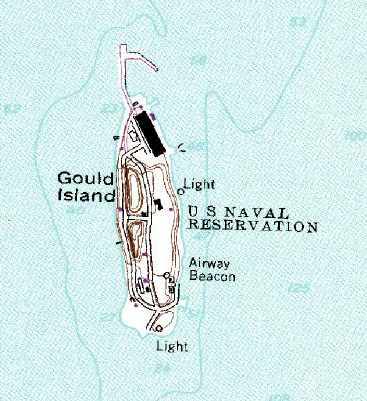 and the Gould Island air facility was designated an auxiliary landing area. From 1941-45, a total of 4,300 test drops of the Mark 13 torpedo were conducted in the waters east of Gould Island. were relieved by the Army’s Battery A, 207th Coast Artillery (Anti-aircraft), Eastern Defense Command. but did not depict any of the seaplane facilities. 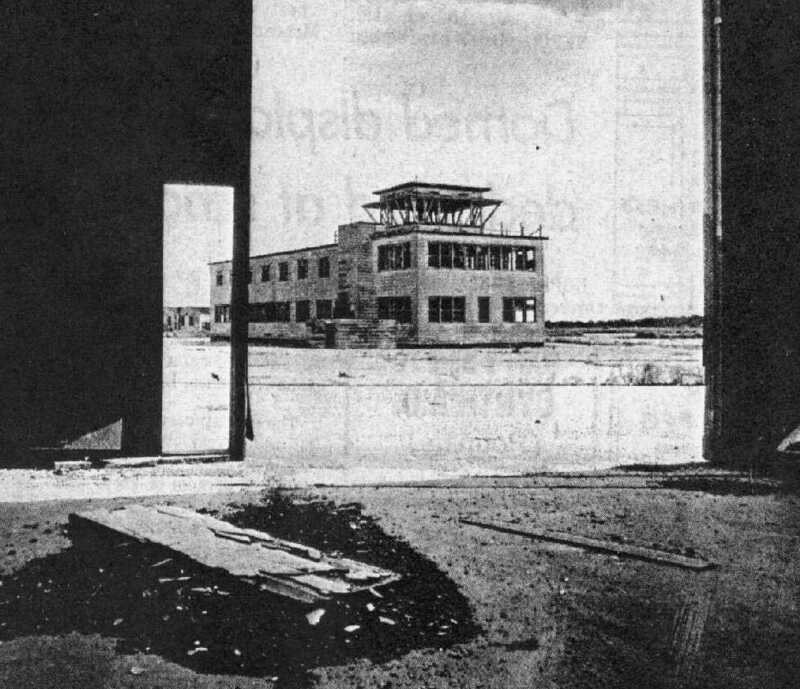 In 1942, construction began for a new hangar & a larger, south-facing ramp for the air facility at the south end of Gould Island. The new ramp was 50' wide & 350' long, with a slope of 6 degrees. It extended 10' below the low-tide level. depicted the seaplane facility as the “Naval Air Depot”. was relieved by the 701st Coast Artillery Regiment (Anti-aircraft). 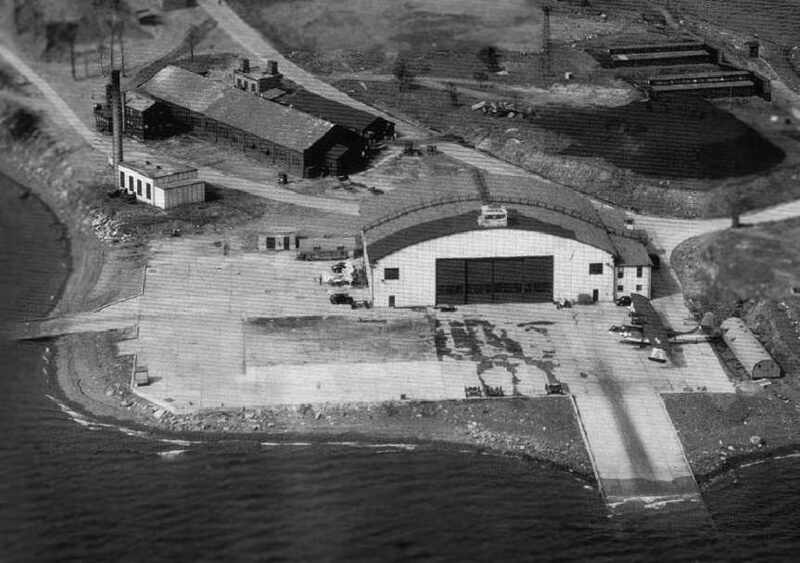 In April 1943, construction of the aircraft hangar at the south end of the island was completed. 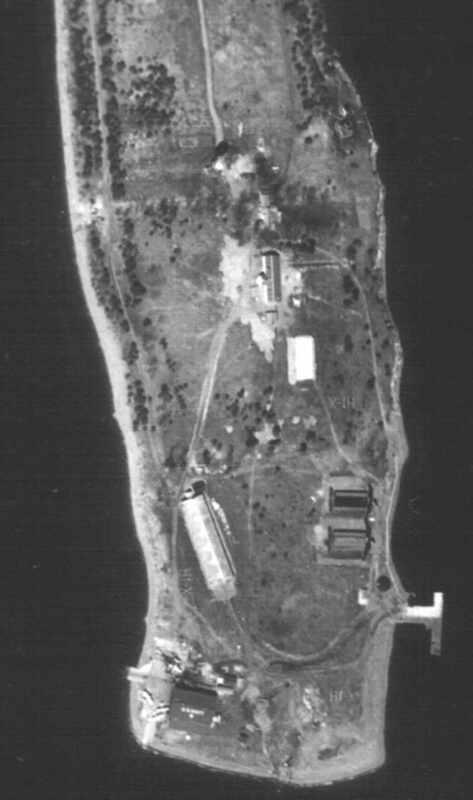 A circa 1940s aerial view looking north at the Newport Naval Air Facility on Gould Island (National Archives). and a rare PBN Nomad on the right side of the ramp (National Archives). John Voss reported, “The Nomad was a variant of the PBY-5 Catalina that was built by the Naval Aircraft Factory in Philadelphia, PA.
Only 156 were built most of which were given to the Russians under Lend Lease. The USN retained about 20 or so for evaluation purposes (never used operationally). a very unique nose turret, a pointed nose, longer fuselage & tall tail. The tall tail design feature was picked up by the PBY-6A & PB2B-2 Catalinas. All PBN's were flying boats [non-amphibious]. Photographs of PBN's in USN markings are very rare. No PBN's are existent in the US [as of 2005] as most were scrapped prior to the end of WWII. In October 1943, construction of the Firing Pier & the adjacent overhaul shop at the northern tip of Gould Island was completed. and 2, on elevators that lowered into the water, for test-firing submarine-launched torpedoes. By the end of World War II, over 65,000 torpedo test-firings had been made from its launchers. At the peak of aviation activity in 1944, the Air Detail included 11 officers, 119 men, and 26 planes. 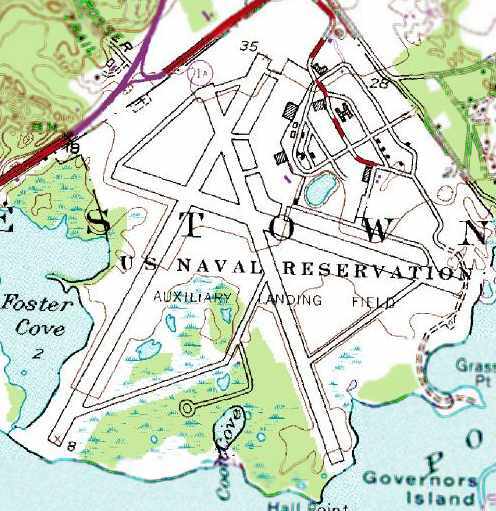 In 1945 the Air Detail was renamed the “Naval Air Facility”. as having a single 156' x 122' hangar on the south shore of the island. It was said to be owned by the U.S. Government & operated by the Navy. 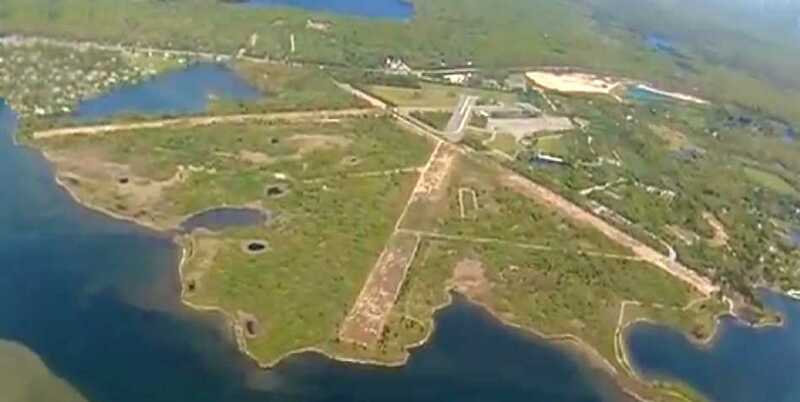 depicted the seaplane base on Gould Island as the “Naval Air Depot”. was on the January 1950 Boston Sectional Chart. 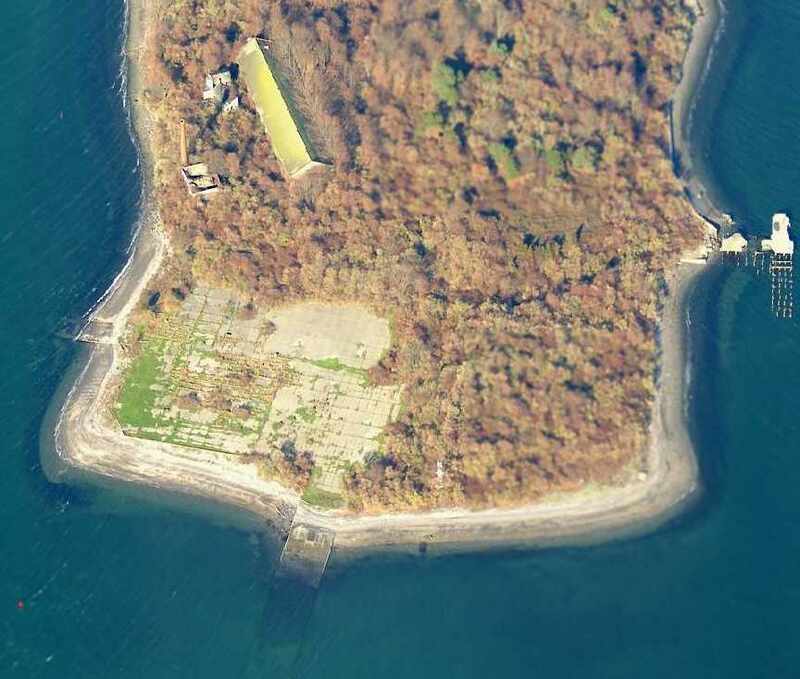 which had succeeded the former Naval Torpedo Station on Goat Island. the torpedo test station is visible at the north end of the island. as there are no aircraft visible on the island. to the US Naval Underwater Ordinance Station, Gould Island in December, 1952. I was there till March 1954. 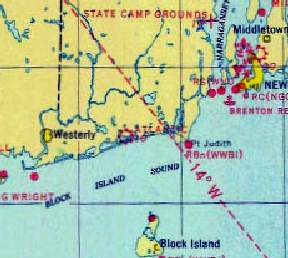 The Gould Island seaplane facility was no longer depicted at on the May 1953 Boston Sectional Chart. 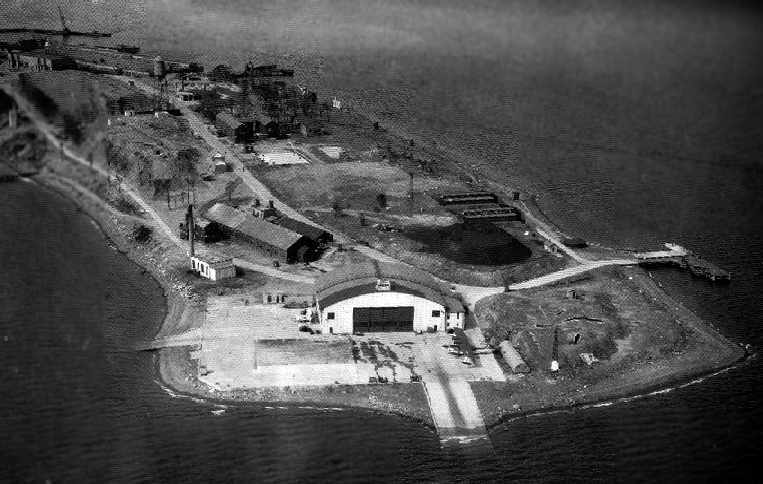 The seaplane facility appeared abandoned but intact in a 1963 aerial photo. but its depiction as such on a USGS topo map doesn't necessarily indicate it was still in operation at that point. as well as having an Airway Beacon along the southeast side. but neither the seaplane ramp nor the hangar was still depicted on the south side of the island. The hangar had evidently been removed at some point between 1951-75. 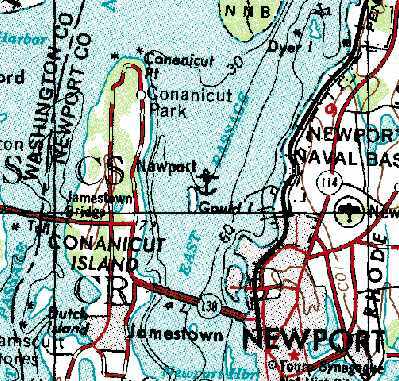 In 1975 the Navy began transferring the southern 70% (about 39 acres) of Gould Island to the State of Rhode Island. 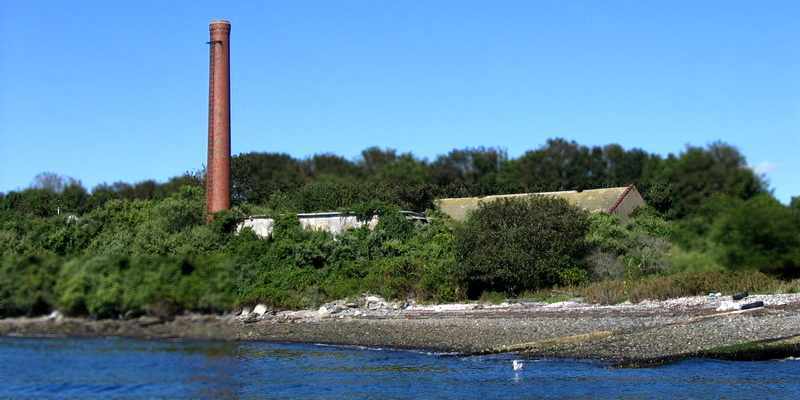 The State gained ownership of 17 acres in 1975 & 22 acres in 1989.
four buildings were declared “historic” by the Navy & the Rhode Island Historical Preservation & Heritage Commission. depicted 2 large buildings at the Firing Pier on the north side of the island. 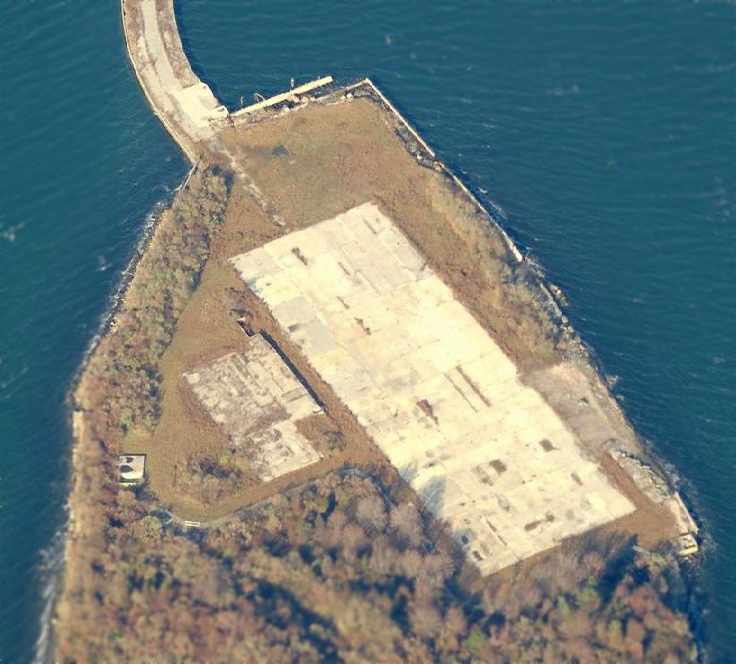 On the south side of the island, the concrete seaplane apron was still extant, but the hangar had evidently been removed at some point between 1963-95. 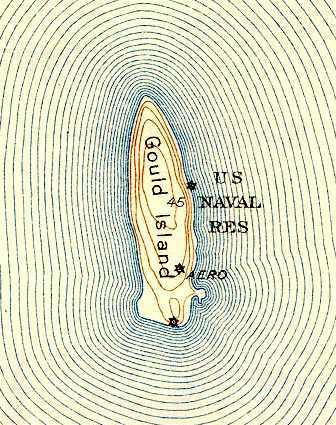 “Gould Island is now the property of the State of Rhode Island. the Navy decided to demolish these 4 buildings. It intermittently continued to test-fire torpedoes from the firing pier. 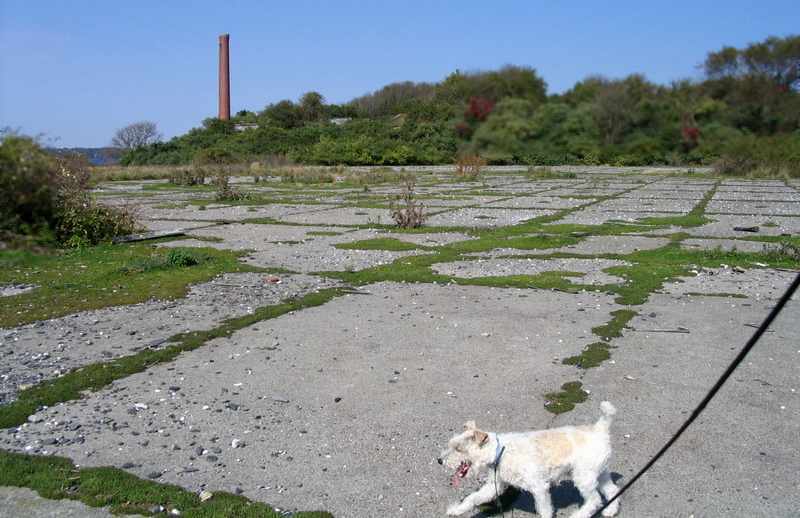 In 2000 & 2001, the 4 Navy structures within the roughly 17 acres that were still Navy property were torn down. 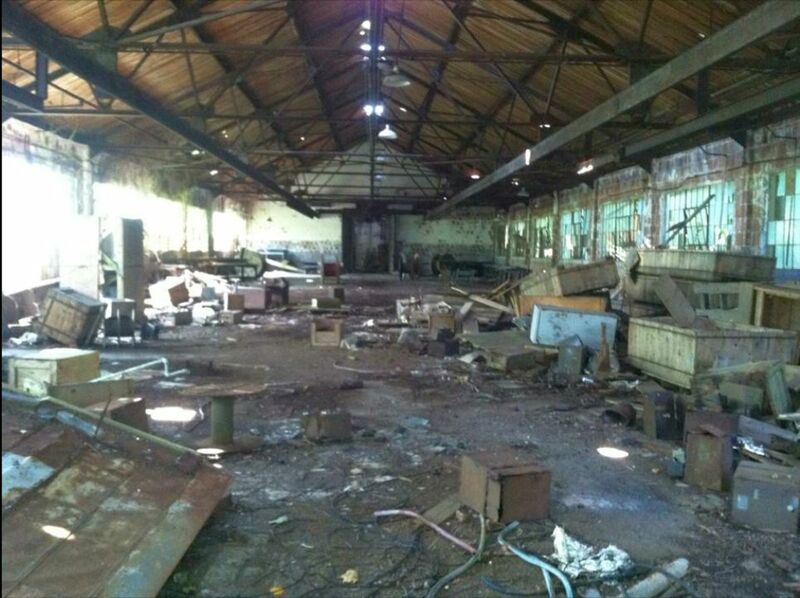 These buildings were the overhaul shop, the power plant, the acetylene building, and the upper 2 floors of the firing pier. The rest of the firing pier was retained. and its importance to the war effort during World War II. That display was on exhibit at the Naval War College Museum as of 2003.
showing that all of the buildings of the Firing Pier had been removed. showing that the concrete seaplane apron remains, along with both ramps leading down into the water. along with a brick smokestack. A 2006 photo by George DiGregorio looking north at the remains of the Gould Island seaplane apron. out to explore the abandoned seaplane / torpedo base on Gould Island. 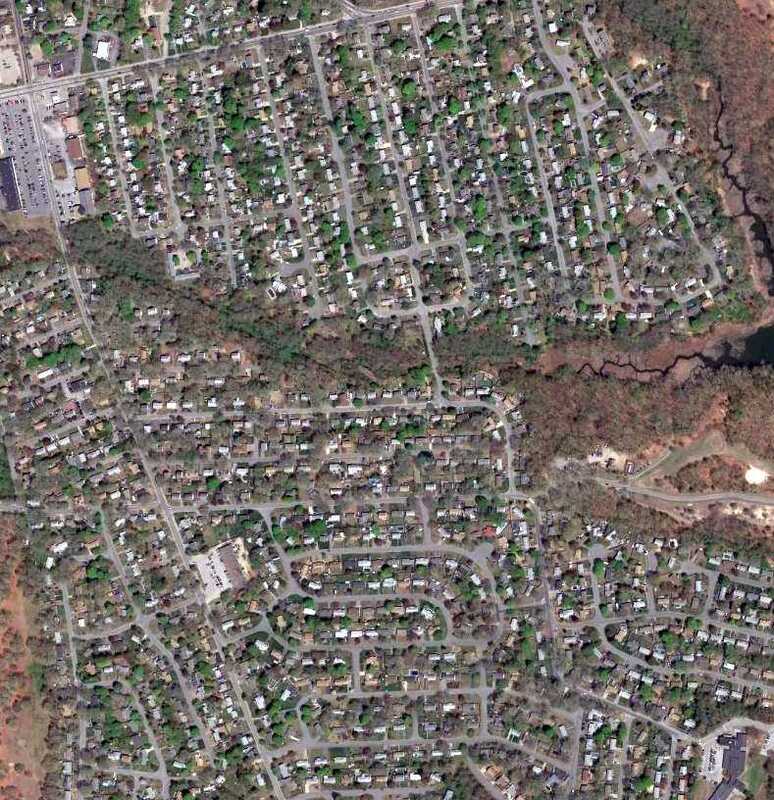 Its still pretty much like the 2005 aerial pictures. 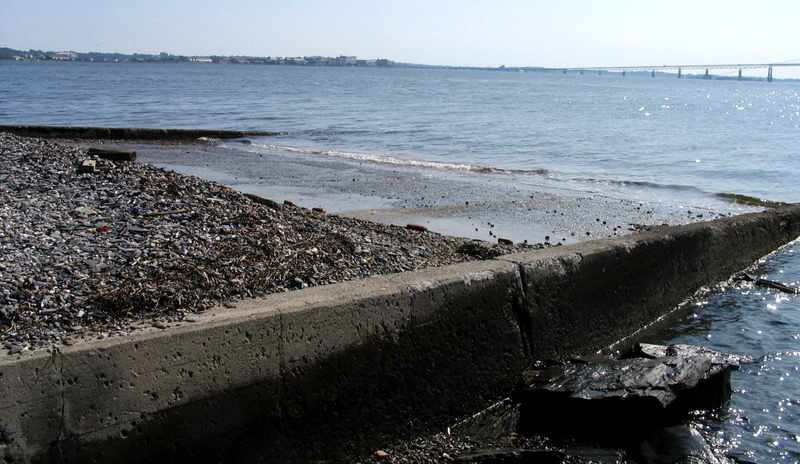 A 2006 photo by George DiGregorio looking southeast along the former Gould Island seaplane ramp. A 2006 photo by George DiGregorio looking east at the smokestack & buildings which remain on the southwest side of Gould Island. 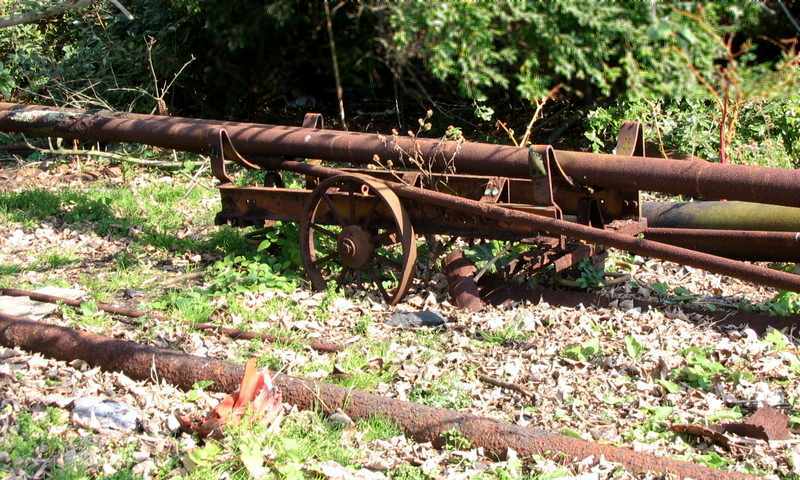 A 2006 photo by George DiGregorio of the remains of a torpedo carriage on Gould Island. A 2006 photo by George DiGregorio looking southeast at the former torpedo firing pier on the north end of Gould Island. A July 2015 photo by Adam Wolff of the remains of the seaplane ramp on the south side of Gould Island. A July 2015 photo by Adam Wolff of the interior of the building on the southwest side of Gould Island. 1931 "Airports & Landing Fields of New England" (courtesy of Chris Kennedy). 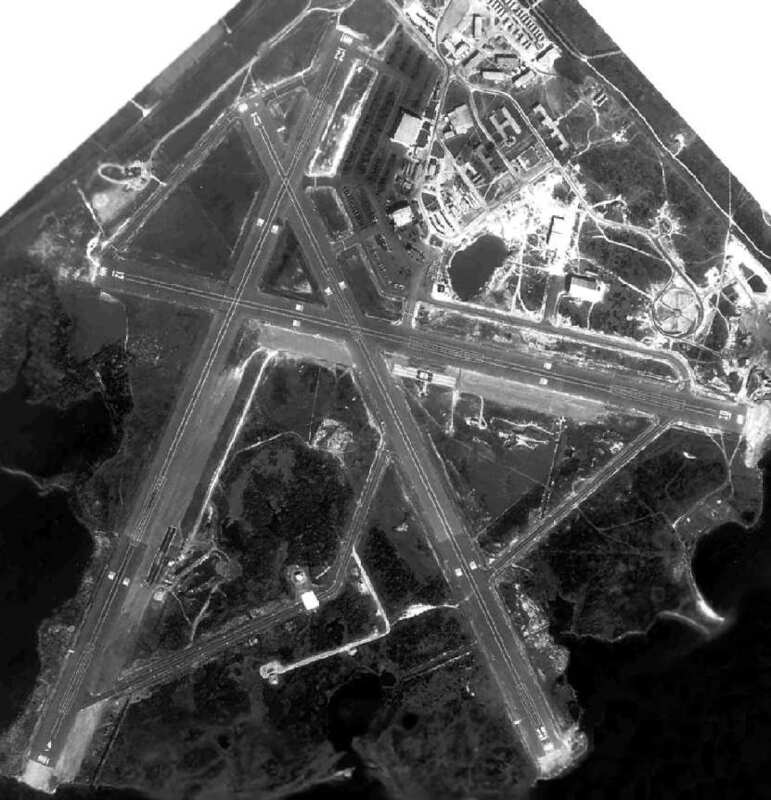 The date of construction of this small civilian airport along the Atlantic coast has not been determined. in which Helen recalled, "South of Post Road was a field that served as an airstrip in the early 1920s for bi-wing aircraft. Every Sunday the Providence Journal Newspaper would deliver the Sunday edition to the airstrip & the newspapers would be flown to the residents of Block Island." was in the Boston Chamber of Commerce's 1931 "Airports & Landing Fields of New England" (courtesy of Chris Kennedy). 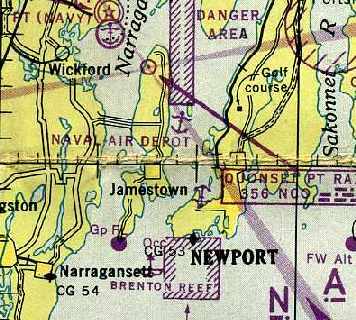 It described Charlestown as a commercial airport, located 9 miles east of Westerly. measuring 3,340' north/south by 700' east/west. The field was also said to have a 60' x 40' hangar. as that is how it was labeled on the 1935 Regional Aeronautical Chart (courtesy of Scott O'Donnell). 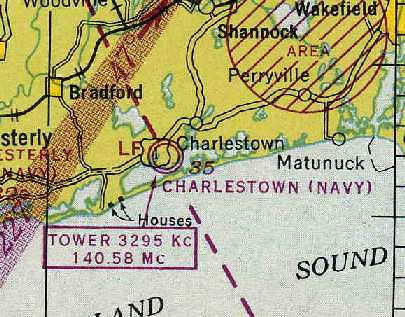 According to Chris Kennedy, Atlantic Airport was described as being located 3/4 mile east of Charlestown. The field was said to have 3 runways, with the longest being the 2,640' northeast/southwest strip. A hangar was located in the northeast corner. According to Jean Pellam, “The airstrip stretched in a southwest/northeast direction. with what appeared to be an unpaved northeast/southwest runway, with a single hangar at the north end. 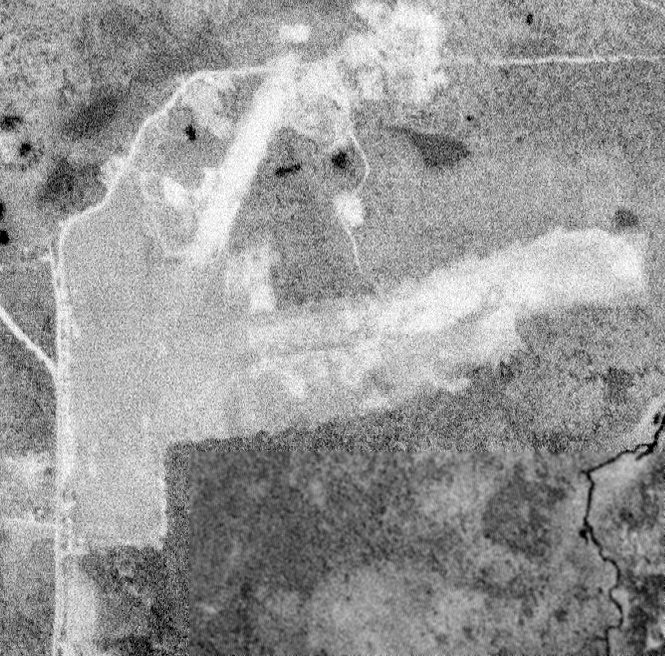 A 1970 aerial photo still showed the airport site as remaining clear. but the hangar remained on the north side. 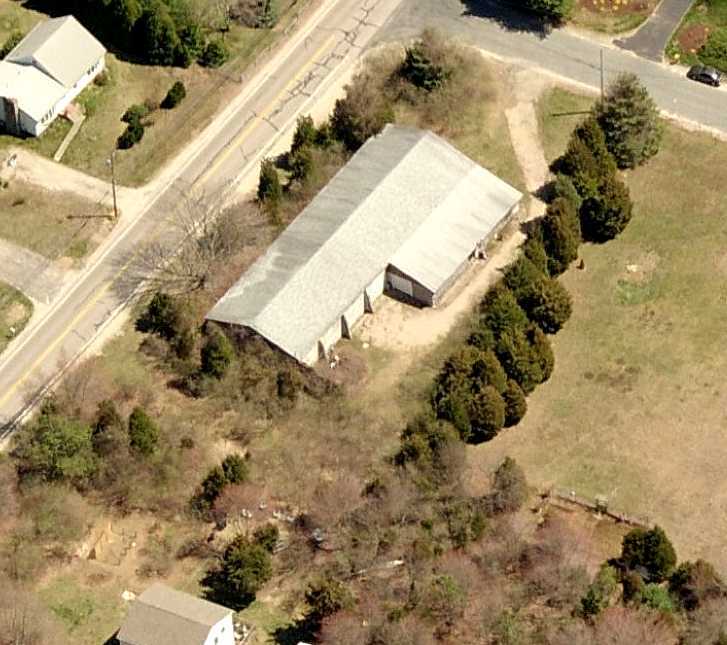 a cement block hangar on the southwest corner of Matunuck Schoolhouse Road & Atlantis Drive. 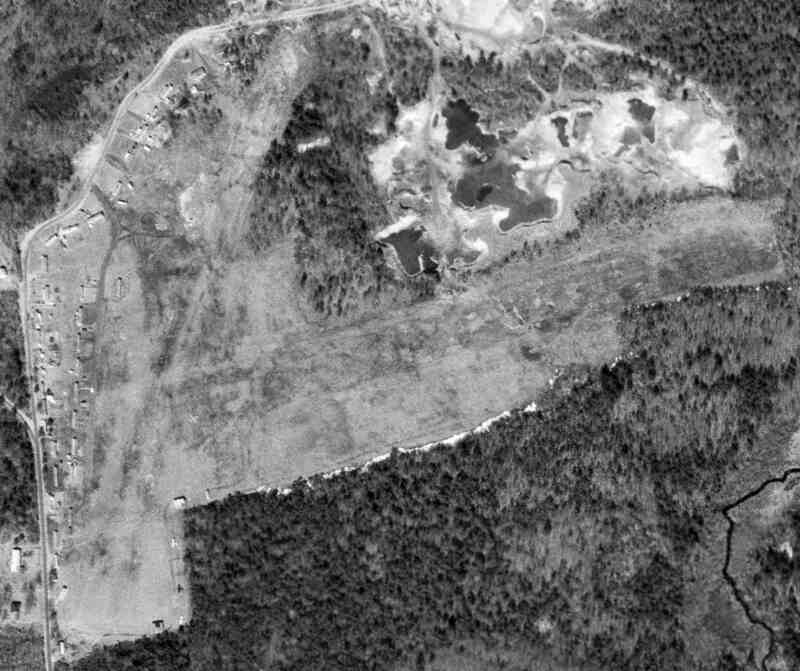 A 4/2/12 aerial photo showed the hangar at the northeast corner was the only remaining trace of Atlantic Airport. 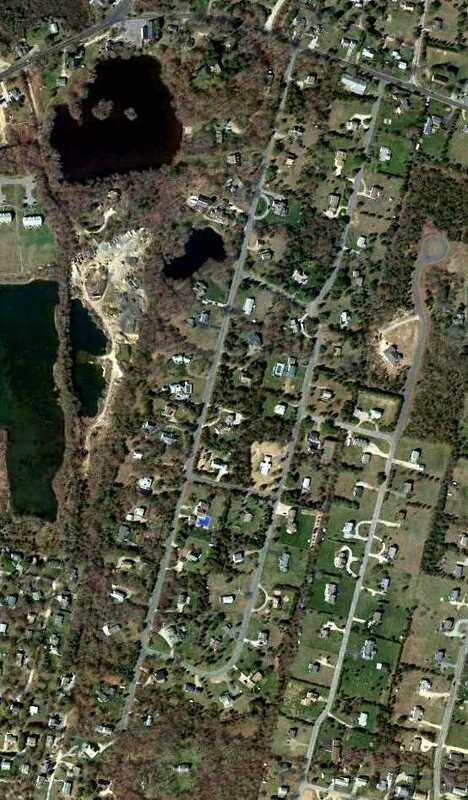 Jean Pellam reported in 2013, “The airstrip stretched in a southwest/northeast direction along or close to one of the roads in the subdivision, Atlantis Road or North Niantic. I think a case could be made that the airstrip provided the base for one of those roads, probably North Niantic. that in more recent years has been used to store potatoes & contractor's equipment. 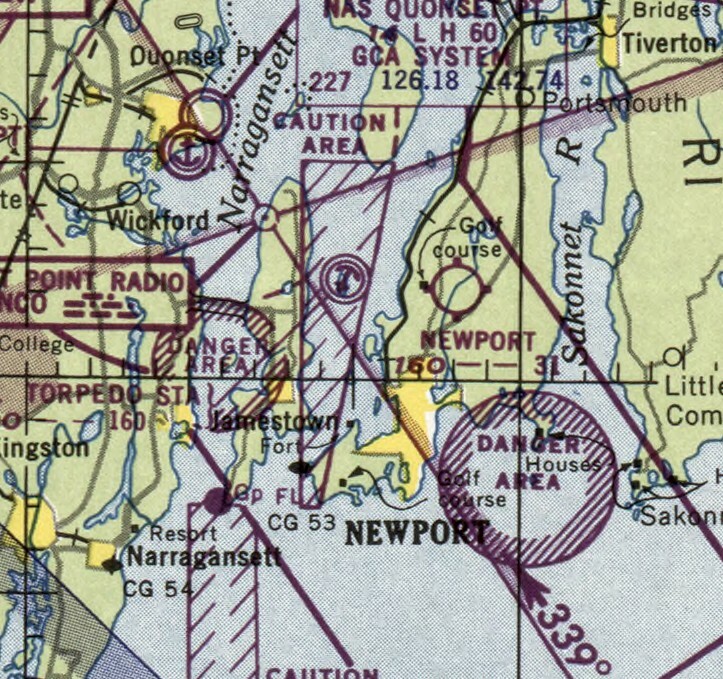 "Charlestown (Navy)", as depicted on the 1944 Boston Sectional Chart (courtesy of Chris Kennedy). 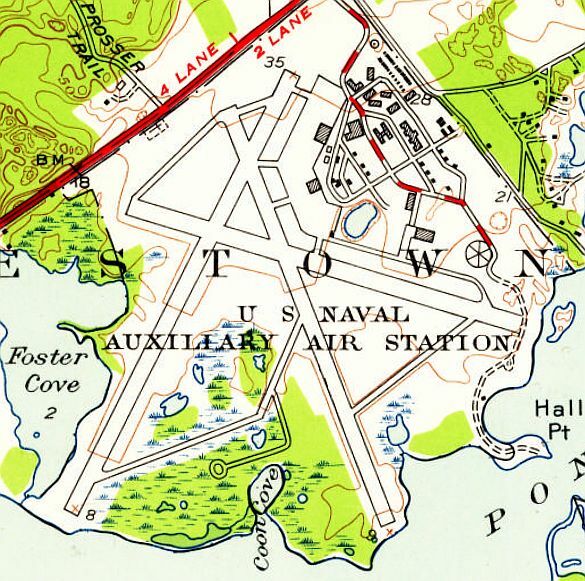 In 1942, the Navy constructed Charlestown NAAS, a satellite airfield for Quonset Point NAS. which developed & tested navigation aids & traffic control systems. was on the 1944 Boston Sectional Chart (courtesy of Chris Kennedy). 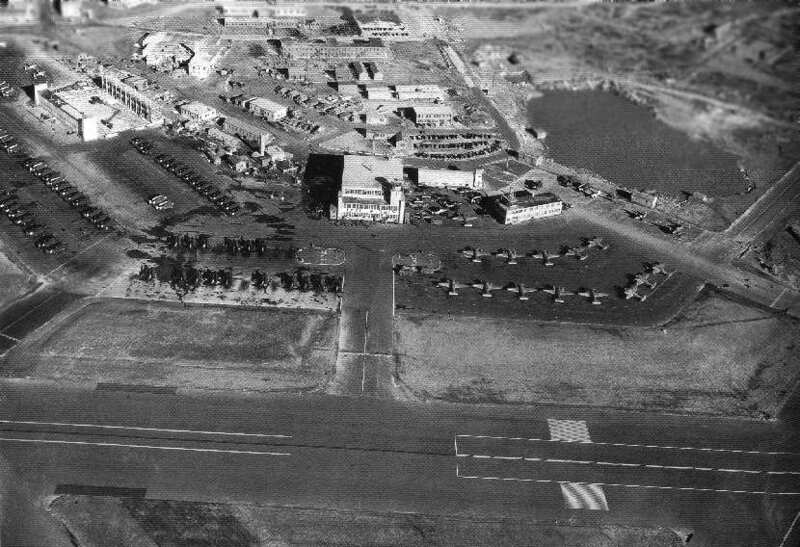 A WW2-era aerial view looking southeast at the ramp & hangars at Charlestown (National Archives photo). that were used to train night-fighter pilots in the use of radar. 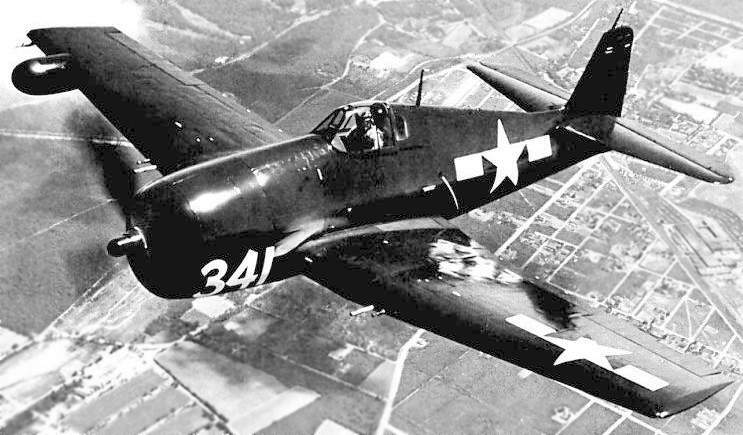 A Grumman F6F-5N Hellcat night-fighter, of the type used at Charlestown. Bob Jeska reports that he "was stationed at Charlestown from the fall of 1944 until the fall of 1945. First attached to a CASU (Carrier Aircraft Service Unit) and later to NACTU (Night Aircraft Training Unit). NACTU had F6F-3N & F6F-5N [Hellcats] & TBMs [Avengers]. The F6F-3N used AIA radar, and the F6F5N had APS-6 radar. through the wing fold to the antenna. The APS-6 had the transmitter-receiver out on the wing & a co-ax cable brought the signal into the plane. 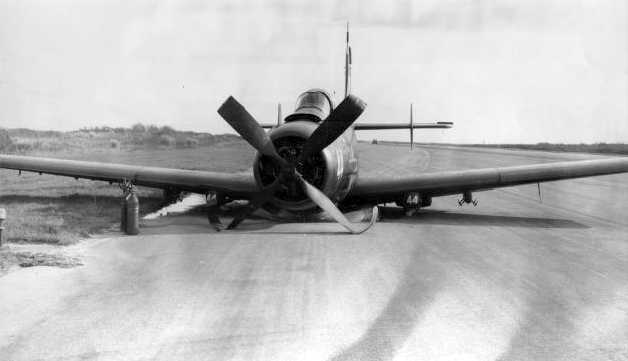 The TBM didn't always carry radar, but when it did, it was an APS-4. It was housed in a thing that looked like a finless bomb, fitted on a bomb rack out on the wing. as a 589 acre rectangular property having 3 bituminous runways, the longest being the 5,800' northeast/southwest strip. to be owned by the U.S. Government, and operated by the Navy. A 1945 Navy aerial view of Charlestown (courtesy of Ron Plante). in 1947 during night carrier landing practice. showed the field remaining completely intact, including at least 3 hangars. There were no aircraft visible on the field, however. 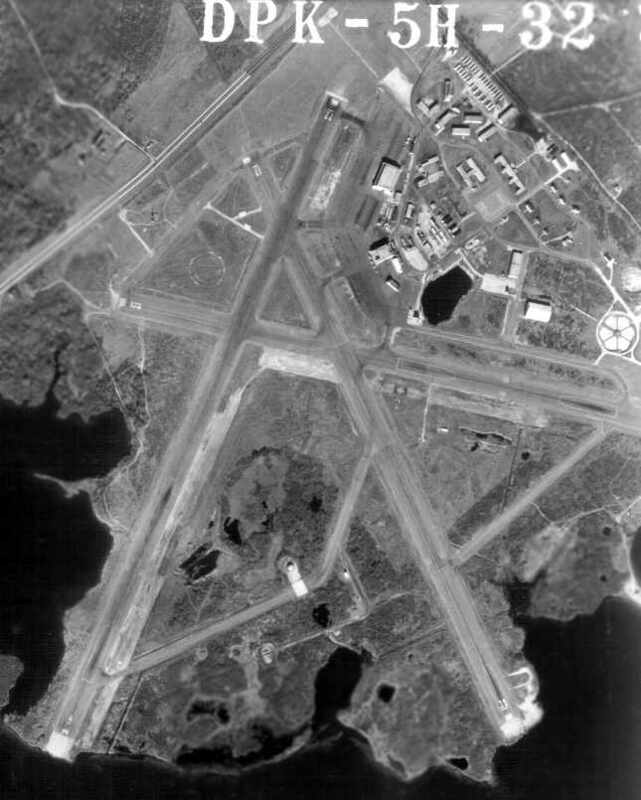 as having 3 paved runways, taxiways, several hangars, and a large number of buildings. by AD-1 Skyraiders from VAW-12 from nearby NAS Quonset Point. Photo is from Guppy Pilot, by Roger Smith, courtesy of John Eckberg. as having a 5,800' paved runway & a control tower. A circa 1950s photo of a VF-71 Grumman F9F-2 Panther (BuNo 123428) which crashed at NAAS Charlestown's Runway 30, with a hangar visible in the background. as described in the November 1959 issue of Rodding Magazine (courtesy of Marty Lineen). with only the central hangar (with attached control tower) still standing. Mary Ann Guerin reported, “Mount St. Charles Academy in Woonsocket bought one of the [Charlestown] hangars in the early 1960s. The school had it dismantled & trucked to Woonsocket where it was re-purposed into an ice rink. My father graduated Mount in 1960 & stated that the rink had not yet been built. 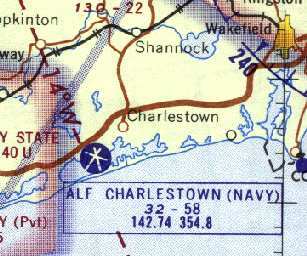 "ALF Charlestown (Navy)" was depicted on the 1965 Boston Sectional Chart (courtesy of John Voss). with the longest being 5,800'. Starting in 1965 some suborbital sounding rockets were launched from Charlestown. The biggest campaign took place on May 30, 1965 in order to watch a solar eclipse. 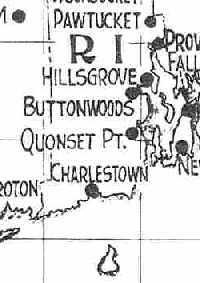 "ALF Charlestown (Navy)", as depicted on the 1968 Boston Sectional Chart (courtesy of Mike Keefe). was a circa 1968 picture by John Gogol of a Navy AD Skyraider which made a gear-up landing. According to Hal Marshall (who served at Charlestown from 1968-71), the base was disestablished in 1974.
and climbed up into at least one of the control tower cabs. there used to be a couple of wrecked planes on a runway. 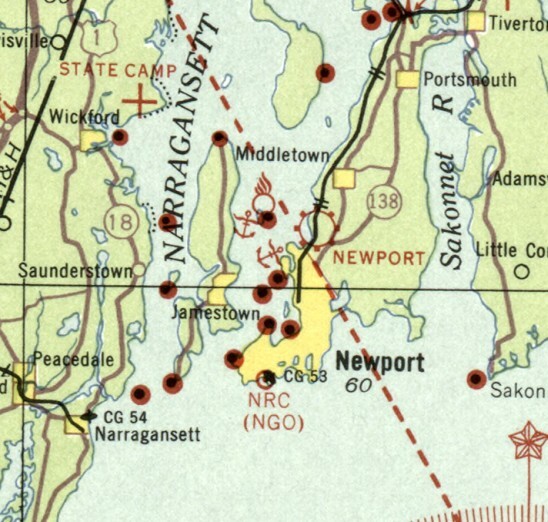 In the early 1970s, the New England Power Company proposed to build a nuclear power plant at the former Naval Air Station in Charlestown. 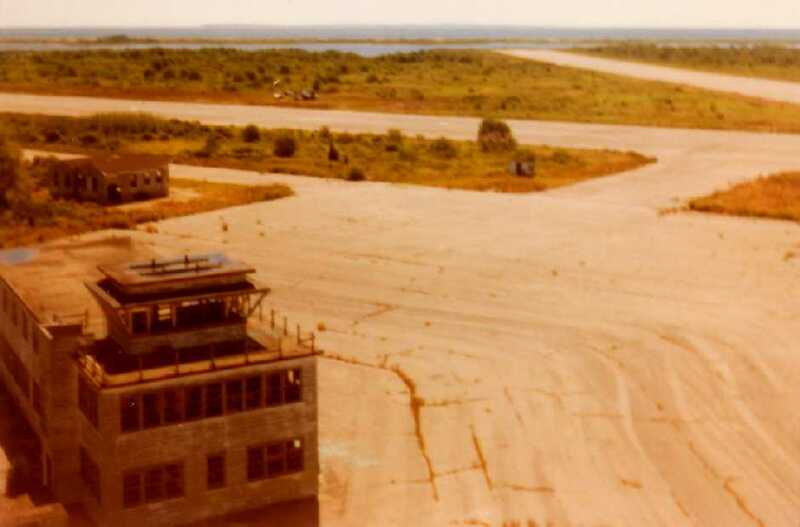 A 1976 photo by Robert Owens (courtesy of David Crandall) looking along Charlestown's abandoned Runway 4/22. 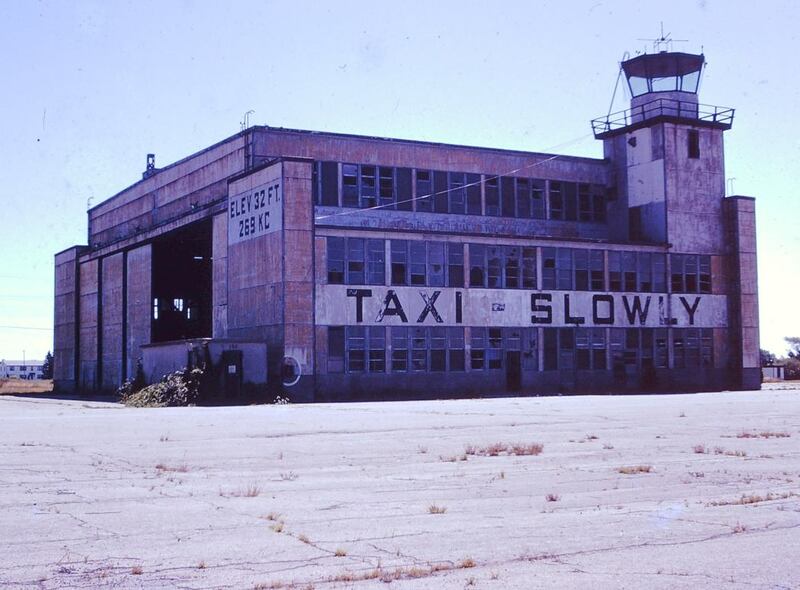 A 1976 photo by Robert Owens (courtesy of David Crandall) of Charlestown's abandoned hangar & attached control tower. A 1976 photo by Robert Owens (courtesy of David Crandall) of the ruins of an AD-5 Skyraider at Charlestown. 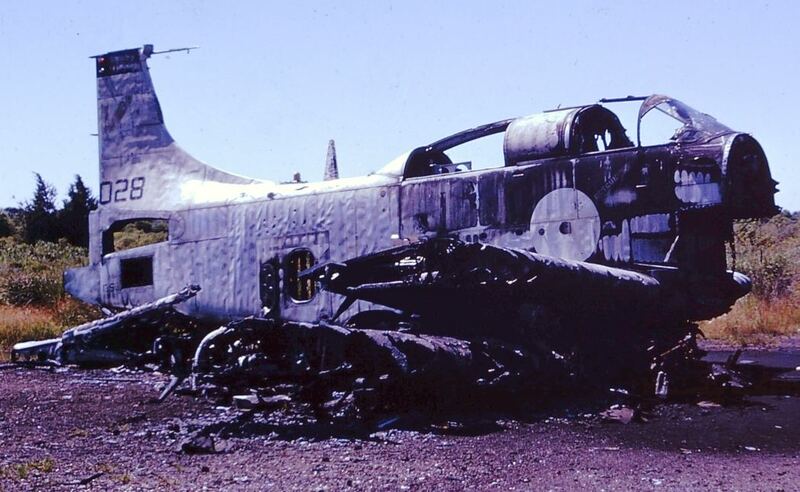 A 1976 photo by Robert Owens (courtesy of David Crandall) of a wreck of an S-2 Tracker at Charlestown, with the hangar in the background. A 1977 photo (courtesy of Paul Zecchino) looking outward from a Charlestown hangar toward the control tower. and the Naval Air Station land was deeded to the town of Charlestown for use as a park & wildlife refuge. A 1978 picture by John Gogol looking southwest at the NAS Charleston control tower from the roof of the adjacent hangar. John recalled, “We would go there every summer, I can still remember them practicing day & night. the field on the west side of the airport across from the pond was a civilian cottage strip. And we would go crabbing around the NAS. At night I would stay up as late as possible watching the string of red blinking lights do touch & goes. 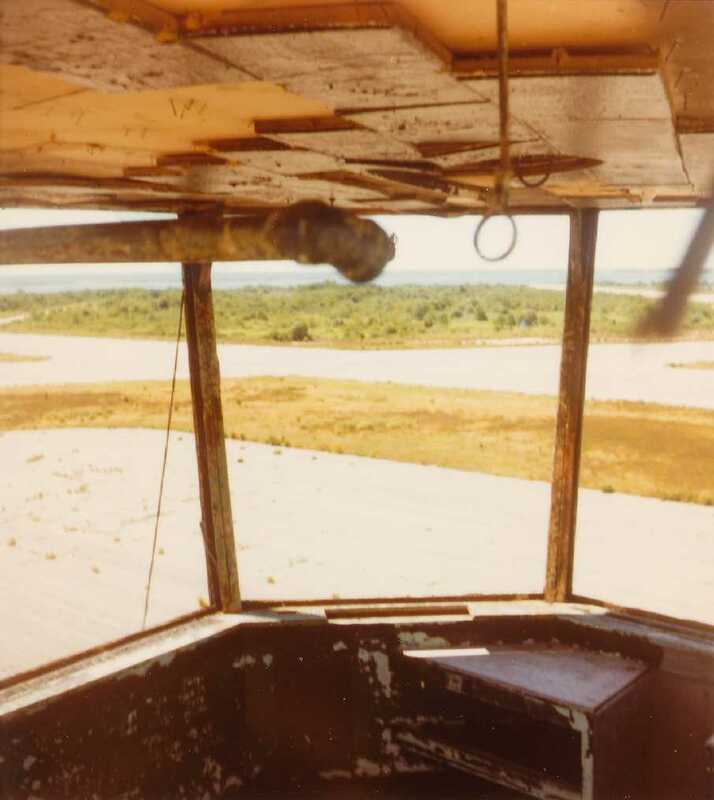 A 1978 picture by John Gogol looking southwest from inside the NAS Charleston control tower cab. 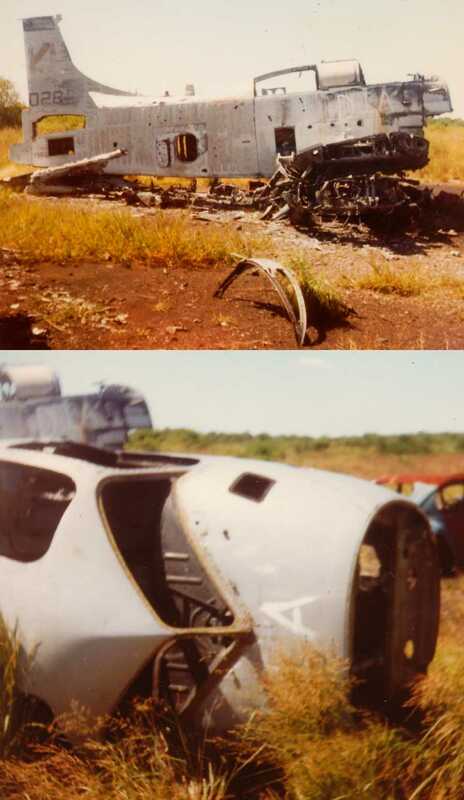 Two 1978 pictures by John Gogol of an AD-5 Skyraider & the remains of another aircraft (an S-2?) at the former NAS Charleston. but the gate was chained so that we couldn't get close." showed that the last hangar still remained standing at that point. showed that all of the hangars had been demolished by that point. as having 3 paved runways, numerous taxiways, ramps, and 2 large hangars. 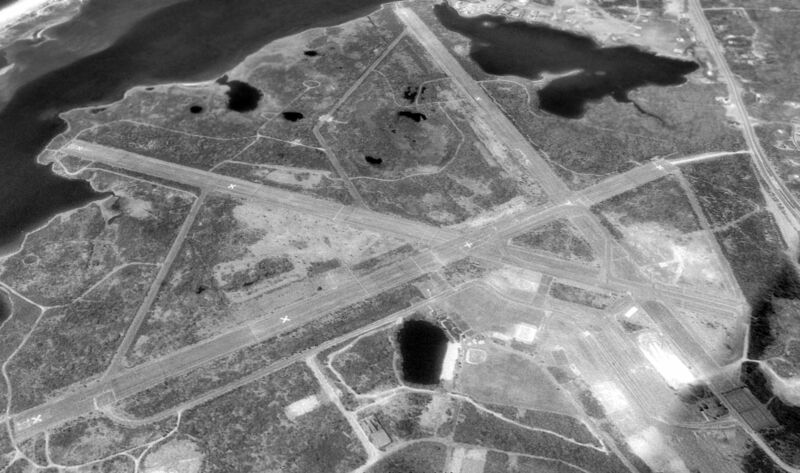 A 1995 USGS aerial view showed the Charlestown runways remained intact. reaching an apogee of 55 miles. The Charlestown property is currently the Ninigret Park & Wildlife Refuge. 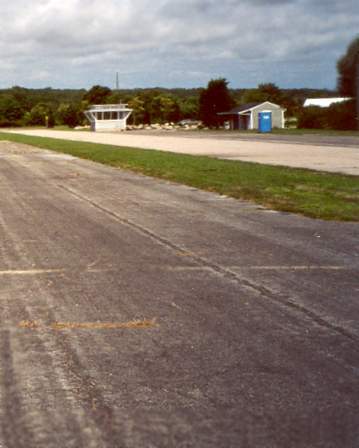 A 2002 photo by John Eckberg of a remaining portion of the runway & taxiway at the north end of Charlestown. The tower cab (previously mounted on top of one of the hangars) is now used for events. but the inexplicable sight of what appears to be relatively recently-painted runway numbers – why? A still from a 2012 video by Graeme Smith looking north at the remains of the Charlestown runways. 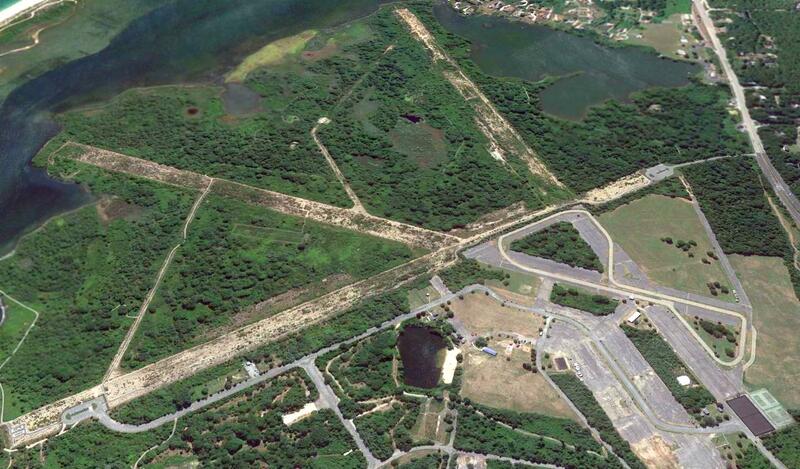 Graeme observed, “Charlestown Naval Air Station [is] now being allowed to over grow as the Ninigret Nature Reserve. 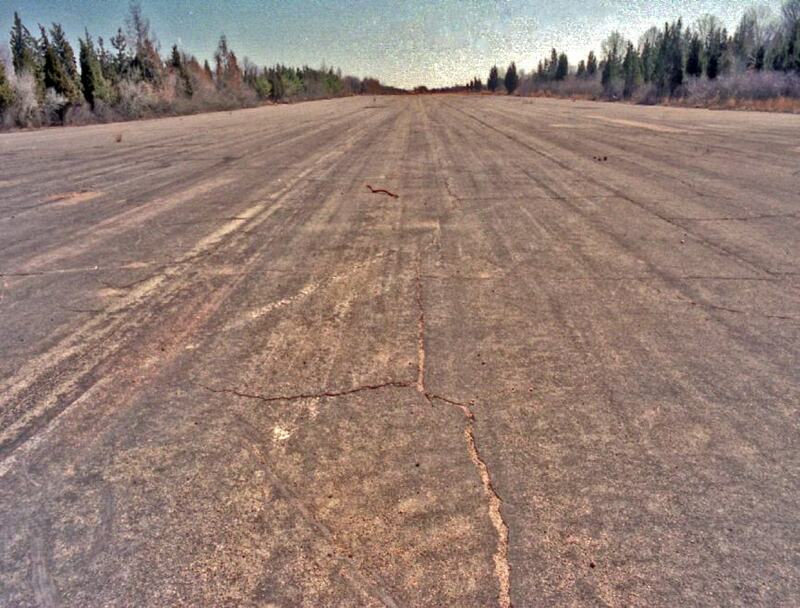 A 2014 photo by John Zirolli looking along the remains of a Charlestown runway. 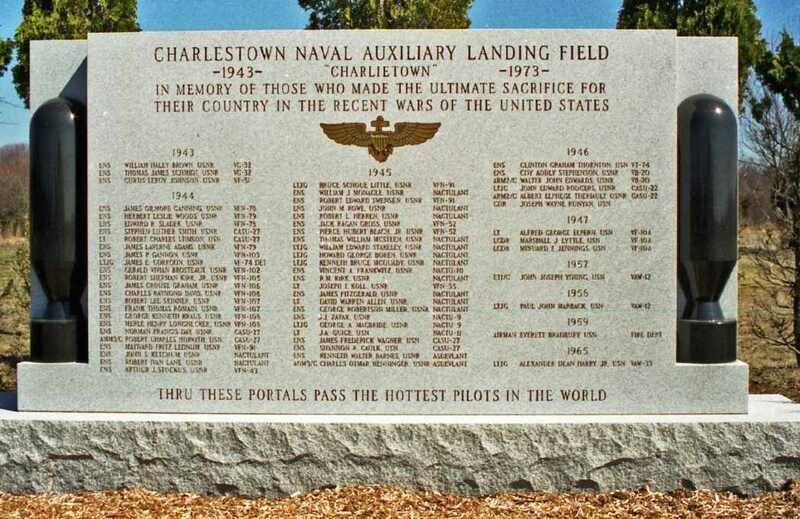 A 2014 photo by John Zirolli of a Charlestown NALF memorial plaque. A 2016 aerial view looking southwest showed the Charlestown runways were still recognizable, although their pavement has been progressively removed. The site of Charlestown NAAS is located south of the intersection of Post Road & RI Route 1A South.